I slept in on Mother’s day, knowing the gallery would not open until noon or later, and knowing I needed to catch up on some lost sleep. I managed to arrive in Waxahachie by 11 a.m., set up in the same place I did yesterday, and gave this courthouse portal one more attempt. I have chosen to stop at this point. This has been an issue with me since the very first day, years ago,when I began this blog experiment. I seldom know what to say about my painting, or about my theories. I give it my best shot every time, but it does bother me to think that I could be throwing out empty words, and guilty of NC’s condemnation. The only thing I can assure my readers of is this: I am always thinking about my art, wondering if my message is conveyed through the images or through the words. At any rate, if my words don’t make sense, then I hope my paintings are good enough to view. And conversely, if my paintings are subpar, then I hope that at least my words have something to say! Sorry if that sounded catty; I take my art and my ideas seriously, and will go to every length to make them worthy of an audience. The paint out at Waxahachie ends at 5 today. I am exhausted, but decided I would try one more painting today. 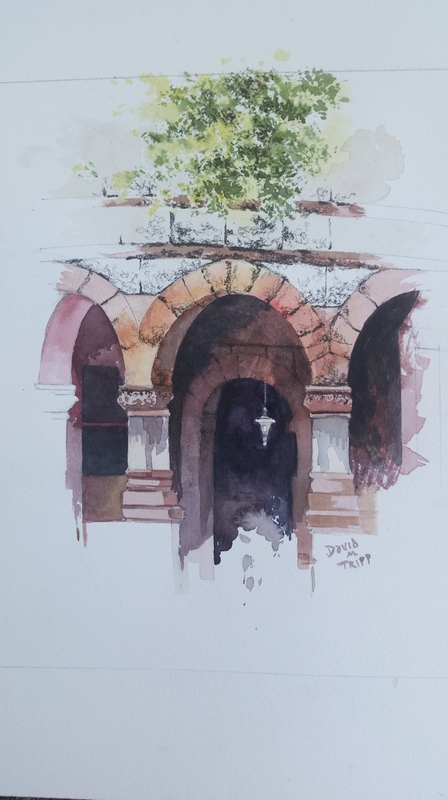 Once again I have attempted to paint the arched portal entries to the courthouse, and am taking a break now to enjoy some shade and reading. 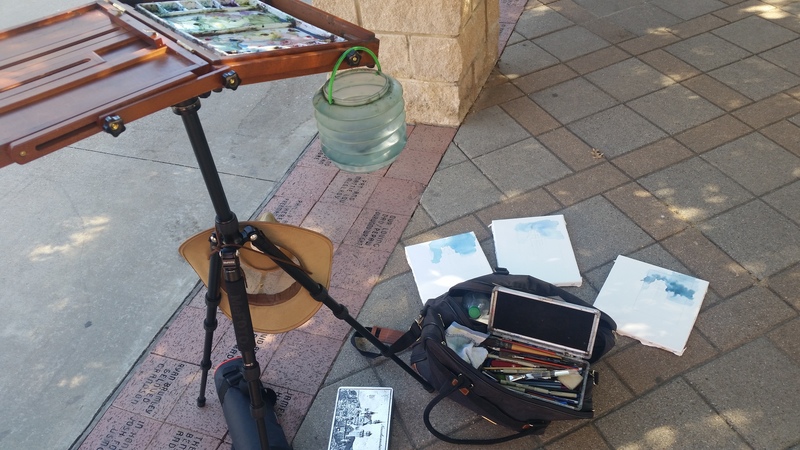 From 9 to 12 this morning at Waxahachie, artists are gathering to do plein air paintings to sell off the easels from 1 to 3 this afternoon. 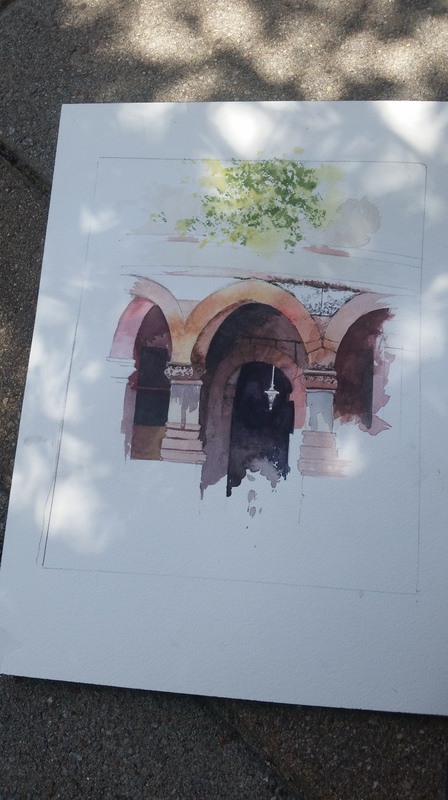 We are all located on the courthouse Square comma and I am going to try to get three paintings done by noon. So far I have three skies blocked in. I will concentrate my energies once again on the courthouse cupola.